Diffusion simplifies and speeds web and mobile app development. With a comprehensive feature set, Diffusion makes developing real-time functionality easy and intuitive. The Diffusion platform is purpose-built for the challenges of IoT, with data-efficient, bi-directional real-time streaming and event handling, to effectively manage data and network volatility and large scalability - solving the complexity of Internet transactions for IoT. Diffusion delivers centralized data management for disparate data sources from back-end and application ecosystems via a user-friendly control center dashboard to unify, manage, authenticate, and secure all data transactions. Diffusion provides a single, multidimensional view of live data and data sources. See and access it all – Your data, your customers, your transactions, your entire business – in Real Time. Diffusion enhances the benefits of Kafka by easily extending Kafka over the Internet for real-time Web, mobile, and IoT applications. Modernizing Legacy infrastructure is simple with Diffusion. Connect and convert polling-based data sources to event-based and real-time streaming solutions via simple connectors and adapters for fast integration of legacy systems. Scale applications and systems quickly and easily. Diffusion is a unique, infrastructure-efficient platform that combines powerful data optimization and compression for seamless integration to the network edge. The Diffusion Real-Time API Management platform connects businesses, people, and things to enable companies, large and small, to quickly create digital products for new business services models and channels. Diffusion simplifies software development of applications and systems, delivering unified, centralized, secure data monitoring, management, and distribution. Diffusion synchronizes live data between back-end systems and front-end applications & devices, over unreliable or congested networks, at scale. Diffusion sits on the network edge to provide reliable, secure, and high-performance distribution of data outside of the data-center to devices, systems, and applications. Available on-premise, in-the-cloud, or in hybrid configurations, Diffusion easily enables new business models and seamlessly supports existing ones. Brenock, a software company specializing in shipping industry applications, needed to assure the Total Marine Solutions Ocean Guardian system obtained maximum operational efficiency and reliable delivery of the critical environmental data compliance for ocean vessels -- they chose Diffusion, the Real-Time API Management Platform to meet the demand. 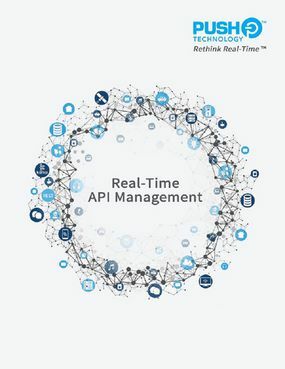 Real-Time API Management solves the challenges of dealing with constantly expanding and evolving data sources and the complex ecosystem where the data resides. Real-time management and distribution of this data is a requirement for the event-driven applications and systems that drive digital transformation. PIA First needed to support a variety of data delivery mechanisms, across multiple foreign languages, for thousands of traders worldwide which unduly burdened their back-end system and made data delivery slow. The company needed to reliably deliver their trade recommendation and analysis data in real-time as they scaled their global customer base. Diffusion solved their challenges.